Addressing citizenship in the context of disintegrating nation-states affected by both “outside” forces (globalization, regionalization) and “inside” forces (devolution, social fragmentation, the hollowing out of institutions) is a difficult academic exercise. Doing so for countries that have emerged from the ruins of a complex, multi-national, and multi-confessional federation represents even more of a challenge. Examining citizenship from both within and without the confines of standard legal definitions thereof, while simultaneously applying a comparative research design, may also seem a daunting task. However, these feats are exactly what the book ‘Citizenship after Yugoslavia’ has achieved. This edited publication is a compilation of individually authored papers previously published in a special double issue of the peer-reviewed journal Citizenship Studies. The book is more than a collection of papers because it represents the collective outcome of the ERC-funded project led by the University of Edinburgh: The Europeanization of Citizenship in the Successor States of the Former Yugoslavia (CITSEE, http://www.law.ed.ac.uk/citsee/). This project has been running for five years (since 2009), and has specifically focused on the ‘citizenship regimes’ of the countries that emerged out of the violent dissolution of the Socialist Federal Republic of Yugoslavia (SFRY), namely: Slovenia, Croatia, Bosnia and Herzegovina, Serbia, Montenegro, Macedonia, and Kosovo. The examination of ‘citizenship regimes’, in the words of Jo Shaw, includes analysing citizenship laws, regulations, and administrative practices, but also the mechanism of political participation (p.3), particularly the dynamics of political inclusion and exclusion. CITSEE researchers thus resisted relying upon narrow, legal definitions of citizenship. Conversely, the essays in this book also examine the issue of refugees and the mobility of individuals; respect for human rights (including the subject of stateless people); salient political concerns and dominant ideological or other narratives; overlapping and multiple citizenships and related legal and ethnic identities; and the manner in which individual country ‘citizenship regimes’ both interact with and influence one another. The CITSEE research team, led by Jo Shaw and Igor Štiks, is comprised of researchers from the targeted countries who work on their individual country case studies within a common comparative framework. Fully aware of complexities, common legacies and the interdependence of different ‘citizenship regimes’ in these newly independent countries, CITSEE has tried not only to make an inventory of citizenships, but to also consider them from both historical and regional perspectives. 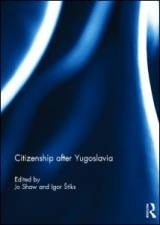 ‘Citizenship after Yugoslavia’ has 9 chapters, but can be effectively divided into two parts. The first part is comprised of two chapters – the first by Jo Shaw and the second by Igor Štiks – in which the main theoretical and methodological concerns of the research are elaborated, and the research framework for other chapters is provided. The second part presents research reports on each of the seven countries that emerged out of the former SRFY. The peculiarity of the CITSEE approach means that only one of the reports was limited to analysing a single nation-state. In relation to Slovenia, isolating the factors and outcomes of the transformation of the nation-state’s “citizenship regime” did not require intra (former) SRFY comparisons. However, in all other cases, examining the ‘citizenship regime’ of one new nation-state included a consideration of the ‘citizenship regime’ of at least one other nation-state (Macedonia and Montenegro), and in some cases, that of several nation-states (Serbia, Croatia, Bosnia and Herzegovina). The enormous influence these new nation-states had on each other’s development and eventual formation further confirms the validity of the specific comparative CITSEE methodological design and theoretical framework that was pioneered in this book. The citizenship context in former SRFY countries has been influenced by at least four powerful factors. The first is a common legacy of the previous federation, which remains critical even after a series of wars in 1990s and the violent birth of new countries. Although travelling somewhat different paths, almost all of these new countries have taken as a frame of reference the citizenship laws and related ‘citizenship regime’ that evolved in the decades between World War II and the wars of SRFY disintegration. Secondly, the approach applied by CITCEE recognizes that before SRFY there was another Yugoslavia (The Kingdom of Yugoslavia, previously the Kingdom of Serbs, Croats and Slovenes, of 1918-1943), which itself succeeded the ‘citizenship regimes’ of previously independent countries (e.g. the Kingdom of Serbia of 1718-1739), and those of the larger empires (the Ottoman Empire of 1299-1922 and the Habsburg Empire of 1526-1804) that controlled territories that now belong to several nation-states in the region. Thus, CITCEE’s intention was to observe the historical genesis of current ‘citizenship regimes’ in the context of longer-term, durable trends, path-dependencies, and cultural, legal and political heritage. The third major aspect to be considered was the establishment of the European style of mono-ethnic nation-states, which were created by carving up the previous multicultural federation in the wars of the 1990s. The war/s, which are often categorised somewhat superficially as ‘inter-ethnic’ or ‘inter-religious’, have indeed strongly affected the definition of the new pool of ‘national’ citizens. These ‘national’ citizens, who were subsequently given what proved to be shallow, formalistic democratic rights, facilitated the creation of the exclusivist form of nationalism that dominated the first multi-party elections in former SRFY nation-states. The practices that resulted from this difficult democratization and nation-state building process often included what Igor Štiks identifies as the ethnic engineering of a titular majority achieved via the manipulation of the ‘citizenship regime’. The fourth factor originated in the environment external to the former SFRY. On one side, the international community (primarily the USA, but also several EU member-states) became involved in the conflict and was the main broker of peace settlements by the mid-1990s. For a number of reasons (not least ideological), these settlements were based on the understanding that territorial borders should follow the ethnic ones. Where that was not accomplished by war or other means, hybrid solutions (such as in Bosnia and Herzegovina, but also Macedonia and Kosovo) emerged from internal territorial and/or institutional divisions based on ethnicity. On the other side, the desire of former SRFY countries to integrate into the EU (Slovenia and Croatia have already done so, and others will probably follow in the near future) required the accommodation of EU principles and practices into domestic legal and institutional frameworks. Hence, newly independent countries with a poor record of quality of democracy that have recently emerged from periods of war are faced with a choice of two opposing paths: to follow the internationally legitimatized ethnic divisions, or to embrace more bifurcated and complex EU citizenship. These countries already had the latter kind of citizenship in the former SRFY. However, they tended to perceive it as the problem, rather than the solution. Indeed, this understanding was one of several factors that contributed to the dissolution of the SRFY. Nonetheless, it remains too early to predict how this new regionalization, and resultant citizenship formation, will play out. Defining who the citizenry was in the course of the violent disintegration of the former SRFY became essential to the definition and consolidation of new regimes. Given that democratization, in the form of first multi-party elections, took place in the war period (in most of those countries), political competition and electoral arithmetic intertwined with the new citizenship policies and war strategies. This is relatively unique phenomena, and is not easily directly compared even with citizenship reforms in Eastern Europe and CIS following the dissolution of the Soviet Union. Hence, the pioneering effort of CITSEE and the book that eventuated from the first several years of its research should be highly regarded because of its academic quality, its emphasis on multidisciplinary orientation, and the methodological innovation. Overall, Citizenship after Yugoslavia is a book for all those interested in at least one (but preferably, a combination) of the following: the causes and implications of the disintegration of the former Yugoslavia; addressing the issue of citizenship beyond legal considerations; and post-conflict democratization and nation-state building. However, even those scholars and students focusing on human rights, ethnic/religious identities, and regional (dis)integration in a broader, comparative sense would find valuable insights in this book. Nenad Rava completed a PhD at the Centre for the Study of Political Change (CIRCaP) at the University of Sienna, in which he examined the relationship between the quality of democracy and nation-state integration. Since 2001, he has worked as consultant for UN agencies, the EU, the World Bank, the OECD, and bilateral donors.